My Command Line is Missing!! Some of you might have noticed that with the 2013 products, by default, the command line is floating. I was teaching class this week and plugged my laptop into a projector that had a screen resolution lower than my initial setting. When I booted up my Autodesk product, the command line was below the screen. I couldn’t grab it to drag it back to a spot where I could see it. I changed my screen resolution back to it’s original setting, and to no avail, the command line stayed where it was, out of the viewing area. To get the command line back, type in CUI at the command line. In the pane on the left side, click on your current workspace. This will populate the pane on the right. Expand Palettes, and click on Command Line. This will populate the Properties pane just below. Change the Orientation from Floating to your desired docked position (Above, Below, etc.). Click OK and your command line will be back. You can then make it floating again by dragging it away from it’s docked position. There are multiple ways to import a DGN file into AutoCAD. First you need to decide on whether or not you want to bring the DGN file in as a reference (think x-ref), or as regular CAD entities. Each of these will prompt you to select a DGN file, then the following dialog will appear. The checkbox in the upper left corner determines whether or not the DGN is imported into the current drawing or opened as a new drawing. 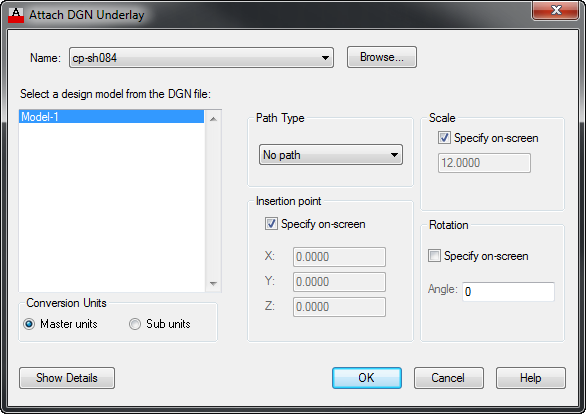 Each of these methods (except drag & drop) will give you the standard Attach DGN Underlay dialog as seen below. If you use drag & drop, the prompts will be on the commands line. Select the DGN reference on the screen. Pick the External References button on the contextual tab to open the External References palette. Select the DGN file and right-click, then choose Bind. In the “Bind Xrefs/DGN underlays” dialog, choose “Insert”, and click OK. Now you can explode the DGN until it is broken down to native CAD entities. We have seen some occasions where certain DGN files fail to import. If you run across this, attach the DGN as a reference and then follow the steps to convert the attached reference to CAD entities. This process applies to AutoCAD, AutoCAD Map 3D, AutoCAD Civil 3D, and other AutoCAD based applications. If you are preparing to upgrade to 2013 and you have network licensed Autodesk applications, please read on. Autodesk recommends upgrading the Network License Manager to version 11.10 for 2013 applications. You can do this even before upgrading the applications since the NLM is backwards compatible. Performing this upgrade and getting your new LIC files in advance can save you time when you do get ready to roll out the new applications. Although the NLM is included with your product, you can also download it separately. For more details, Jimmy Bergmark at JTB World has put together a comprehensive set of information and download links regarding this new version of the NLM. AutoCAD comes equipped to create PDF files, with no additional programs needed. 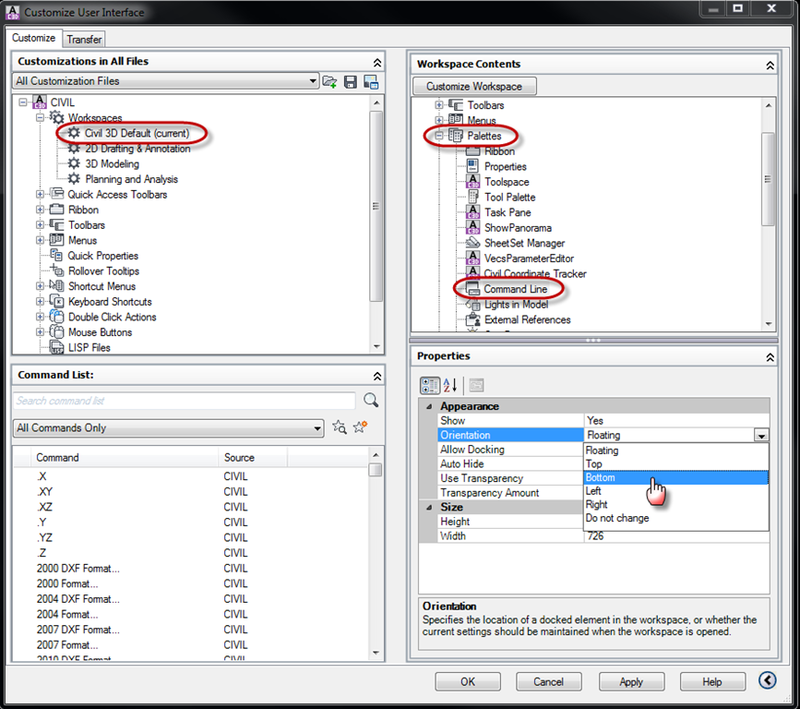 When you go to plot or publish, choose the PC3 file named DWG to PDF.PC3. There are some options when using this PC3 file that are easily overlooked. After you select this printer name, click the Properties button and then click on the Device and Document Settings tab. Select Custom Properties, and then click on the Custom Properties button. 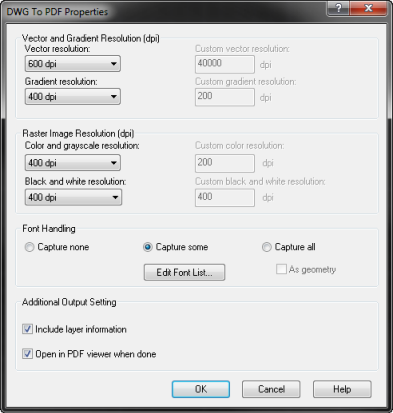 In the dialog that opens, you can specify the vector, gradient and raster image resolution settings, whether or not to capture fonts, whether or not to include layer information in the PDF, and lastly, whether or not to open the PDF when the plot is done. 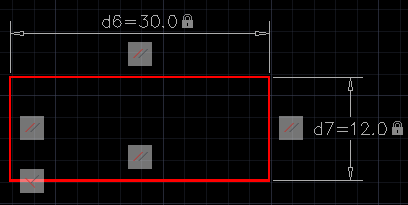 Have you ever wanted to draw a rectangle in AutoCAD and wished it would stay that shape? Although there is a specific Rectangle command, it simply creates a polyline entity, not a smart rectangle object. What if you could make a smart rectangle that would hold that shape? It’s easy to do, follow along. This tells AutoCAD to apply geometric contraints as possible, on newly created objects. Now draw a rectangle. You should see that three geometric constraints were applied (five constraint icons are visible). The top and bottom lines are parallel, the side lines are parallel, and one corner is constrained to perpendicular. At this point, editing commands will not be allowed to change the shape of this object. If you grip edit one corner, the rectangle holds shape and only allows change in size. You could further constrain this object by size using dimensional constraints to limit the editing ability even more. Constraining a rectangle to shape and size is just one of many possibilities. Explore geometric and dimensional constraints and let us know how you are using them.